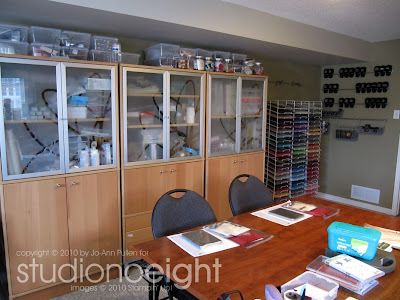 One of the things that I like about having workshops other than getting together with the girls is it gives me a reason to get off my ^&*%$ and tidy up. I﻿ must admit I don't put things away but one thing I am learning from my absolutely wonderful neighbour is that it takes a second to put it away after using but hours to clean up the big mess after. So for the month of December I am making my own challenge of putting things away once I am done and going through all those boxes that I have thrown things into cause I was to lazy to put away. 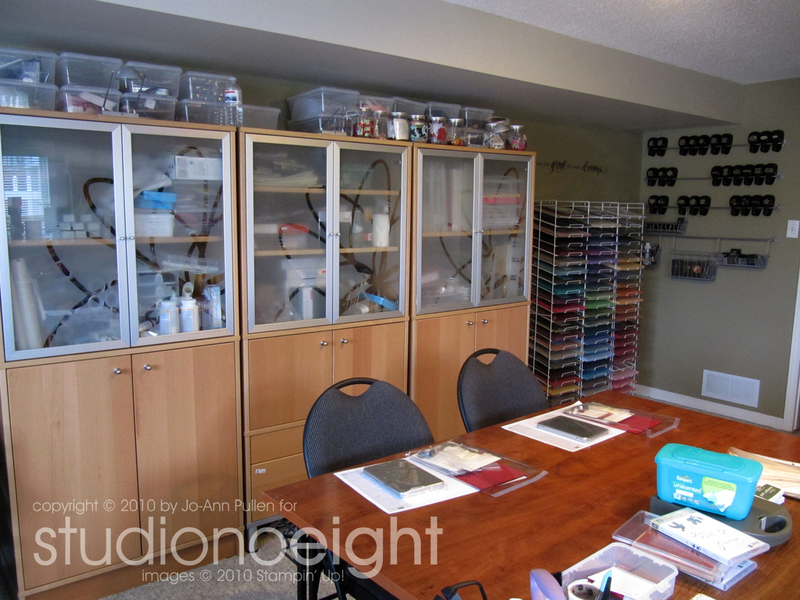 So here is the tour of my studio, enjoy and if you have any questions let me know. 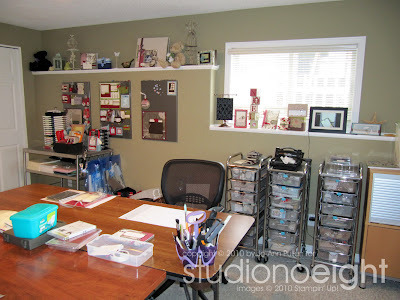 All nice and clean set-up for my workshop Deck the Halls Scrapbook Tin yesterday what a great afternoon with the girls. I have the best windows allow natural light in, and the shelves are great to display my work and collection of my favorite things, like birdhouses, lanterns, and vases all things that I like to use in my photo shoots. I also have three magnet boards that allow me to change things up on a whim right now it is all about holidays! I also have my chef cart, yes I have a food cart in my studio that I roll around, its great to hold things I use all the time, like my ink pads, etc. Do you see all those Zip lock bags hanging off the cart? This is something I started to do when I found them at Walmart, I thing Marlyn told me about them. I use those for every project I am working on, I have about 8 of them and then hold everything that I need to work on that project, this way if I get bored with one project I can easily work on another one and it keeps me nice and neat. And those metal carts I love them, I bought those years ago at Costco, I love the wheels they are so cool and industrial like my chef cart! I am everything about Paris, even though when I went there years ago I didn't have a very good impression of romance and history, but the 80's were another time and things have changed since then. 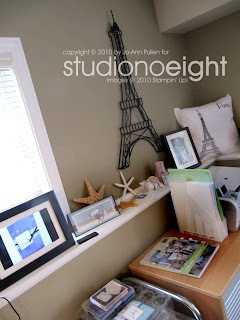 This is where I print things and is a continuation of the the above picture again allowing me to display samples, a picture of my husband in Scotland, I love metal wire objects, such as birdcages, dress forms, lanterns and of course the Eiffel tower, why even my pillow is displayed more as a decor. 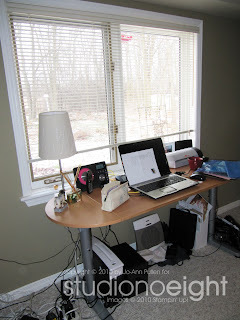 All of my furniture is from IKEA, except for the work station, I love the module feel, clean lines and the metal feel about them. Just a close-up showing my collection of things on the shelf most of these items have been used in one of my photo shoots at least once﻿. 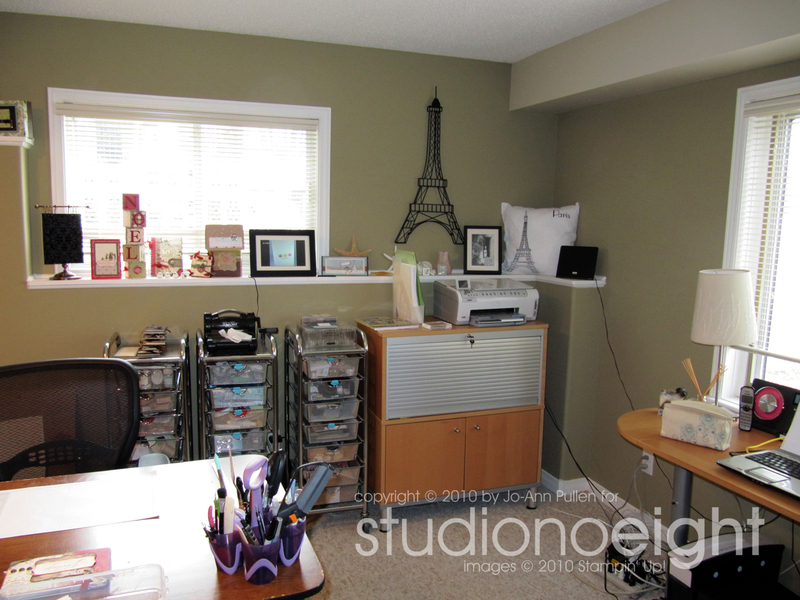 This is where I do my computer work, I do all my fun creative things at my work table which is in the middle of my studio. I need lost of room, mostly because I don't clean-up after myself but this is going to be my New Years resolution. 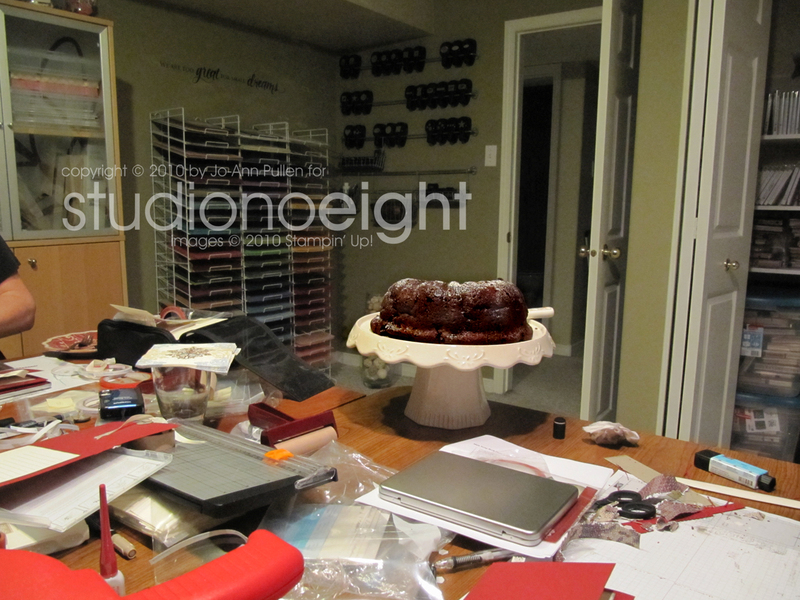 I must clean up every time I leave my studio. It will be a challenge, maybe I should do a pool as to how long it will take for me to go back to my bad habits? 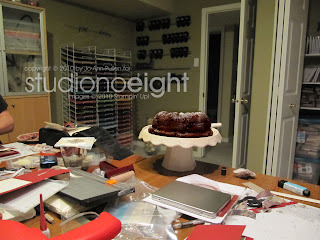 Come to one of my workshops and I reward you with my Chocolate, Chocolate, with more Chocolate, extra moist bunt cake. I swear the girls were working even faster know that this was yet to come! LOL, trust me you haven't tasted cake until you try this one, recipe to come. 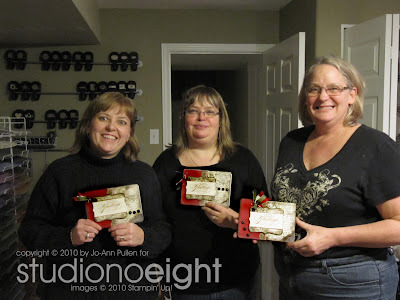 And here are Lisa, Kim (though I wanted to call her Jennifer) and Donna with there wonderful projects complete. They did a fantastic job! Just look at those smiles! I will be offering this workshop again in December classes are small so it is more personal maximum spots available is 4. Thank you for sharing the photos of your studio...what a great crafty haven you have! Would you mind sharing the room dimensions ... 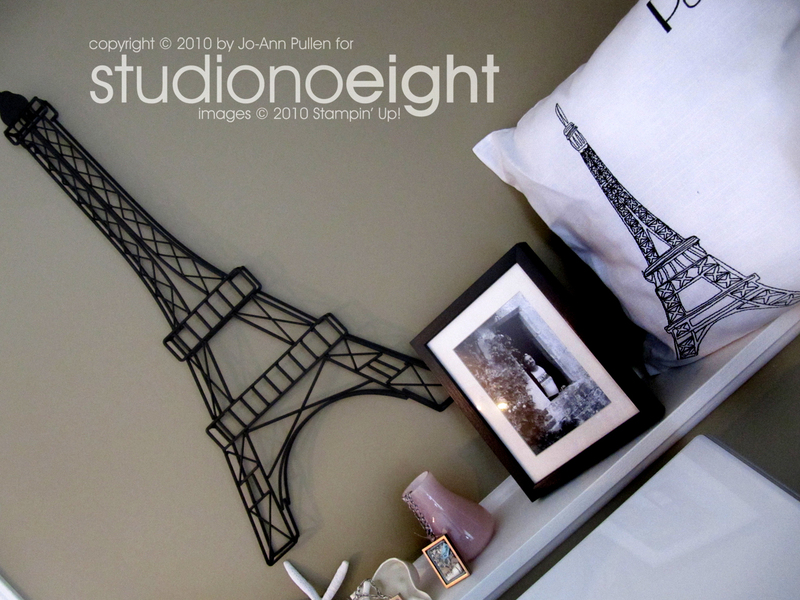 I'm keeping a wish list for my dream room and yours pretty much fits the bill! !